Little Ra Sheed Jackson was home with his grandmother Nov. 29 in Richmond, Va., when the older woman suddenly collapsed. 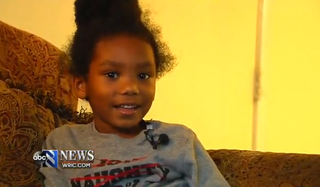 However, the smart 4-year-old jumped into action, knowing exactly what to do, WRIC reports. Ra Sheed’s mother was at work, but the little boy dialed his aunt, who had gone out shopping. Ra Sheed, who had learned how to call 911 from his teachers, did just that, staying on the phone with paramedics until they arrived at the home. When the emergency responders couldn’t get in because of the chain lock on the door, the resourceful little boy sprung into action again. He showed WRIC how he climbed up on a couch near the door, balancing precariously on the armrest to remove the chain and let the medics in. It is believed that he likely saved his grandmother, Sandra Wright, who the news station notes suffers from diabetes and high blood pressure, making the situation potentially serious. “Good that he knows his numbers and knows how to work a phone,” Sheree Wright said. Ra Sheed’s family isn’t the only group of people who think the little boy is a hero. The 4-year-old was honored Monday night at a Richmond School Board meeting, where he received a standing ovation and was given a special certificate. “We want to tell you that we love you and we appreciate you and we are so glad you were there to take care of your grandmother,” Richmond School Superintendent Dana Bedden said at the ceremony, according to WRIC.